To Stratford-upon-Avon Picturehouse for a live broadcast of the Royal Ballet’s Manon, choreographed by Kenneth MacMillan. Very splendid it was too, with Marianela Nuñez and Federico Bonelli as the principals, and with screen director Ross MacGibbon providing a master-class in how to translate a fiendishly complex three-act ballet to the cinema. 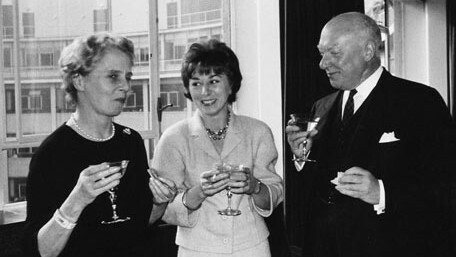 This post is intended to highlight the work of one of MacGibbon’s distinguished predecessors as a screen interpreter of dance, Margaret Dale, but let me note here that I am also fascinated by MacMillan. Jann Parry’s richly interesting 2009 biography Different Drummer: The Life of Kenneth MacMillan vividly portrays a conflicted man and a brilliant artist. And my interest in the relay was also piqued by seeing Marianela and Federico rehearse a pas de deux during the recent World Ballet Day online. The Royal Opera House have made this clip available on their terrific YouTube channel, and I embed it here simply because it is technically astounding and achingly beautiful. As with the revival of multi-camera live presentations of drama by NT Live and RSC Live from Stratford-upon-Avon, live ballet for cinemas works with broadcast techniques developed in television studios in the 1950s and ’60s. Interpreting a performance of a play or a ballet by mixing live between three, four or more cameras surrounding the action is a demanding technical and creative challenge. The use of the phrase “performance capture”, with its suggestion that the process is somehow unmediated, fails to recognise the extensive range of choices that a screen director must make rapidly and with certainty. She or he must respond with sensitivity and understanding to the performance, and for dance a number of the finest such directors, including Ross MacGibbon and Margaret Dale, were previously dancers themselves. Born in Newcastle in 1922, Margaret Dale joined Ninette de Valois’ Vic-Wells Ballet company in 1938 and made several pre-war television appearances as a dancer. After the war she began to choreograph, including some short ballets for television, and then she joined the BBC as a producer. One of her first credits as a screen director was on Turned Out Proud, a 1955 original dance work for television choreographed by Kenneth MacMillan. The following year she oversaw the television presentation of Aurora’s Wedding from The Sleeping Beauty from Covent Garden with Margot Fonteyn and Michael Somes, shown to mark the tenth anniversary of the re-opening of the Royal Opera House. Also in 1956, and also from Covent Garden, she directed the live outside broadcast of the second act of the Bolshoi Ballet’s Swan Lake with the legendary Galina Ulanova. This broadcast has been issued on DVD by ICA Classics, and a substantial extract is on YouTube. In 1957 Margaret Dale produced a studio production of Coppélia, 1957, with Nadia Nerina and Robert Helpmann. In 1962 BBC Television contracted with the Royal Ballet to record nine ballets, and among the results were Giselle, shot on 2 June that year in the studio by Margaret Dale, with Margot Fonteyn and Rudolph Nureyev (and also released by ICA Classics). A further delight from ICA Classics is La Fille mal gardée, also recorded in 1962 by Maragret Dale (and broadcast on 27 December), with Nadia Nerina and David Blair. Margaret Dale continued to create exceptional dance for the screen throughout the 1960s, although this later and often more contemporary work is far less accessible at present. In the 1970s she made a number of notable documentaries about dancers and choreographers. All of which needs further research, which can be facilitated by the collection of Margaret Dale’s papers which are held by the British Film Institute. In the meantime, for more on Margaret Dale, who died in 2010, see the obituaries by Humphrey Burton for the Guardian, from the Telegraph, and by Alastair Macaulay for The New York Times.